In an interview by Jim Fleming on Wisconsin Public Radio’s “To the best of our knowledge,” Daphne Sheldrick talks about her book, Love, Life, and Elephants. She had known Eleanor since she was a two year old orphan and had successfully rehabilitated her back into a wild herd. Occasionally, she went to visit Eleanor, who would come over, greeting her affectionately. They would spend a few moments together, and then Eleanor would go back to her herd. One day Daphne Sheldrick wanted to introduce Eleanor to one of her human friends. They set off to find her, and thought they had spotted her by a waterhole. She didn’t look quite the same, but she was standing there quite unafraid, so it had to be Eleanor. When called, she came over. Daphne Sheldrick stood next to her and put her hand up to touch her behind the ear, as she always did with Eleanor. It was then that she realized her mistake. The elephant was startled and lashed out, using the same amount of force she would have used with another elephant, sending Daphne Sheldrick sprawling on the ground. A moment later she felt the elephant trying to pick her up with her tusks. With her knowledge of elephants, she knew the elephant would already have killed her if that was her intention. Instead, she was trying to help her. Daphne Sheldrick had a broken leg. The elephant gently touched her with her trunk, trying to help, but seeing that there was nothing she could do, after a few minutes, she turned and walked away. Daphne Sheldrick discovered later that this elephant, who she called Kathryn, was Eleanor’s best friend, and apparently the two must have had a talk with each other about Daphne Sheldrick, because Kathryn, a wild elephant, had immediately trusted her and even came when called. Kathryn only lashed out when she was unexpectedly startled, and then she was sorry, not having intended to cause any harm. David Sheldrick, when he was alive was the founder warden of Tsavo National Park, which is the size of Michigan and which holds the largest population of wild elephants in Kenya. Daphne Sheldrick worked in the park with her husband, and together they began to care for and rehabilitate orphaned wildlife. After David Sheldrick’s death in 1977, she continued this work and founded The David Sheldrick Wildlife Trust, in memory of her husband. Courtesy of the Kenyan government, she has lived and worked in the Nairobi National Park since that time, caring for wildlife, with a dedicated staff, at the Orphan’s Nursery. To hear this Wisconsin Public Radio interview with Daphne Shelton online, click here. To visit the website of the David Sheldrick Wildlife Trust, click here. I am delighted that you posted this interview, Sharon! I love the frequent updates –stories, really–of DSWT’s work posted on their website. 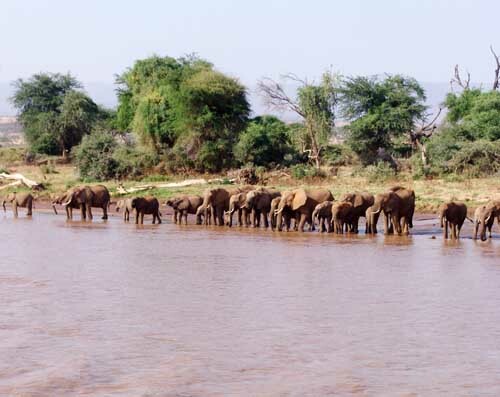 I see that you took the photo at Samburu National Park. When did you visit Kenya and did you go to see Daphne at DSWT while you were there? I love elephants and wouldn’t have known of the interview without you. Thank you! I almost had a chance to meet Daphne, but there wasn’t quite enough time. I was in Kenya in 2010. Thanks for posting the link, Pamela. Hope you’re doing well!